Living in the great and unpredictable state of New York can sometimes be a challenge for its year-round residents. Each season brings on a different extreme: heat, cold, inclement weather…you name it, New Yorkers have seen it. But how can cultural institutions prepare for the worst? What resources are there for museums to learn how to protect and preserve their collections? That’s where the Cultural Heritage Agency of the Netherlands (RCE) comes in. This November, in partnership with New York State Office of Parks, Recreation and Historic Preservation (OPRHP), MANY will be hosting a “Risk Management for Collections” workshop with the RCE at the Oneida County History Center in Utica, NY. We talked to Renate van Leijen, Advisor of Safe Heritage at the RCE, and Bart Ankersmit, Ph.D., Senior Researcher at the RCE and mastermind behind the program, to learn more about “Risk Management for Collections,” the Cultural Heritage Agency of the Netherlands, and why the Dutch are coming back to New York. Here are five things you need to know before you join us in Utica on November 13. 1. The program is an extension of Dr. Ankersmit’s previous work. After finishing his Doctorate in Inorganic Chemistry, Dr. Ankersmit started working at the RCE – then known as the Central Laboratory for Objects of Art and Science – in 1996. He initially worked on the preventative conservation of silver artifacts, but after four years, his interests shifted to risk management. In 2009, Ankersmit published new climate guidelines for Dutch Museums, in which, he says, “a decision-making process is presented that combines the value of the building and the objects with climate risks to find an optimum mitigation strategy.” At the end of 2016, Ankersmit and his colleague, Marc Stappers, published an English translation of the guidelines: Managing Indoor Climate Risks. Over the past few years, Ankersmit has developed a risk management tool through several workshops in close collaboration with the International Centre for the Study of the Preservation and Restoration of Cultural Property (ICCROM) and the Canadian Conservation Institute (CCI). This internationally cooperative work is what led to the publishing of the “Risk Management for Collections” workbook, which will be distributed at the November workshop. 2. We may not be able to avoid natural disasters, but we can still prepare for them. “Preparedness is really an important issue,” says Ankersmit. “Because we as heritage professionals can’t avoid a flooding of rivers, [it is our job] to ensure that water does not threaten the collection.” Ankersmit and van Leijen say that disaster preparedness for a museum’s collections is a lot like making an emergency plan for other disasters. They suggest that museum professionals write up emergency response instructions and stay in close contact with emergency responders in their towns. “Make sure that they know you have vulnerable heritage [collections],” they say. 3. Attendees will learn a lot in just one day. 4. New York State has strong ties to the Netherlands. Time for a brief history lesson! After several thousand years of being inhabited by tribes of Algonquian and Iroquoian Native Americans, what is now known as New York State was visited by Henry Hudson, an English navigator sailing for the Dutch East India Company in 1609. Before the colony was seized by the British in 1664, who renamed it New York, the Dutch built Fort Nassau in what is now present-day Albany, settled New Amsterdam (present-day Manhattan), and parts of the Hudson Valley, and established the colony of New Netherland. What does this have to do with Risk Management for Collections, though? The State Historic Site system consists of 35 sites owned and operated by the OPRHP – six of these sites, five of which are in the Hudson Valley, are connected to the Dutch’s heritage in New York State. “This valuable training opportunity will allow the OPRHP to share this newly acquired knowledge with all of the many historic sites and museums connected to Dutch heritage in the Hudson River Valley Corridor of New York, raising the capacity of many institutions,” Ankersmit and van Leijen say. 5. This program is valuable to anyone and everyone working in museums. The Risk Management for Collections workshop will be held at the Oneida County History Center on November 13, 2018, from 9:00am to 3:30pm. All attendees are invited to join MANY for a reception at 4:30 following the workshop. Register today; space is limited! About the RCE: The Cultural Heritage Agency of the Netherlands (RCE Rijksdienst voor het Cultureel Erfgoed) is part of the Ministry of Education, Culture and Science. The RCE helps other parties to get the best out of cultural heritage. They are closely involved in listing, preserving, sustainably developing and providing access to the most valuable heritage in their country. They are the link between policymakers, academics and practitioners. They provide advice, knowledge and information, and perform certain statutory duties. The windows in the MANY office look out onto the Hudson River just below the Green Island Bridge where boats approach the northern most navigable point before they turn west onto the Erie Canal or Mohawk River. As I begin my third year as Executive Director of MANY at the eastern edge of New York’s crossroads, I am excited to imagine the routes we will travel north, south, and west in the coming months. Our programs start early this year to help get MANY members and colleagues out in the glorious fall weather. You can check out our entire fall event schedule and register for programs here. On August 30, MANY will be at the Thomas Cole House with a grant program workshop led by Humanities New York, a tour of the historic house, and a Meet-Up on the lawn. I enjoy thinking of Cole as an immigrant to New York whose perspective as a newcomer helped him see and reflect how culture and nature are inextricably linked in our American identity. If you are a museum professional in the Capital Region, register now because space is limited! If you are from outside the Capital Region, but plan to travel “upstate” for the Labor Day holiday, think about coming up on Thursday and joining us. Come to Canandaigua on September 6 and see all that the Sonnenberg Gardens and Mansion State Historic Park has to offer. Restorations have breathed new life into the historic gardens, making this a must-see on any travel to the Finger Lakes. Join us at Sonnenberg for a Collections Assessment for Preservation Workshop followed by a tour of the gardens, green house, and mansion topped off with a MANY Meet Up. Dedicate a day to professional development and join us at Fort Ticonderoga on September 20. The Fort opens at 9:30 AM and Meet Up participants will receive free admission all day. At 1:30 we will enjoy gorgeous, sweeping vistas of the Green and Adirondack mountains during a narrated 90-minute boat tour aboard the Carillon on Lake Champlain. At 3:30 Fort Ticonderoga Museum staff will share their unique approach to telling history. Collections, Curatorial, and Public History staff will discuss how their annual focus on a single year of Ticonderoga’s history delivers specific and powerful experiences through collaborative and creative approaches. Our Meet up at 5:30 will offer beer, wine, and light refreshments and time to network with your North Country colleagues. 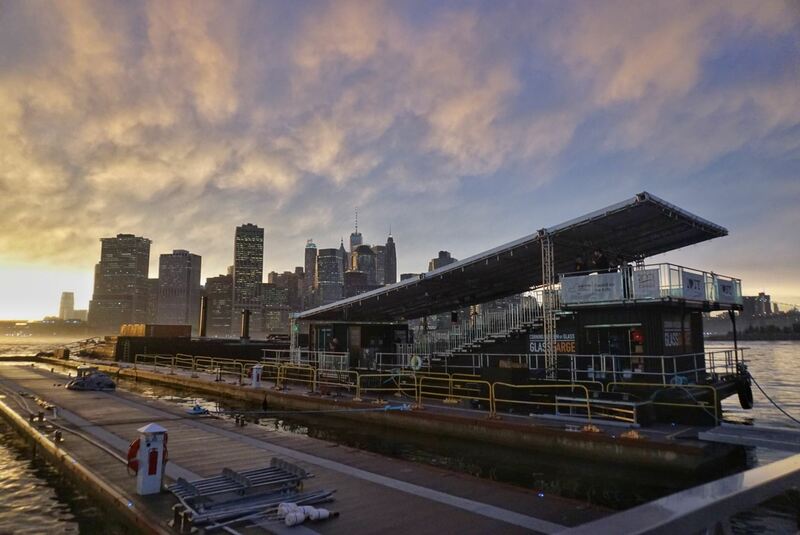 Admission, the tour and Meet Up are free, but tickets for the boat tour are first-come, first-served with discounted tickets at $30 per person. We close September at Great Camp Sagamore with the 2018 Museum Institute Leaders Define Leadership. We are excited to announce that this year includes a “Night at the Museum” at The Adirondack Experience and a boat tour on Raquette Lake. Formal sessions will include building cultural competence, supporting financial and human resources, enhancing board capacity, and creating professional communities. The program is structured so that each attendee will step into the role of and explore what it means to be a museum leader. At the time of publication of this e-newsletter, there were only nine spaces left! After 50 years in operation, The Studio Museum in Harlem is shaking things up with a big move, heralding in a new, innovative era for the Museum. Founded in 1968 with a mission of highlighting the work and amplifying the voices of artists of African descent, The Studio Museum has created spaces in the art world for black and African artists that were otherwise inaccessible to them. Now, the Museum is taking great strides with the construction of a brand-new building, designed by Adjaye Associates’ founder and principal architect, Sir David Adjaye OBE and the award-winning New York museum architecture firm, Cooper Robertson. The new building will celebrate the core mission of the Museum and the artists it collaborates with through specially-designed spaces. We spoke with Alani Bass, Marketing Coordinator for The Studio Museum, about the steps the Museum has taken – and is continuing to take – to prepare for an exciting new future in Harlem. Tell me about the construction of the new building for the Studio Museum. How did this all start? For 50 years, The Studio Museum in Harlem has been a trailblazer in the global cultural conversation by presenting, collecting and interpreting the work of artists of African descent. However, the Museum has never occupied a space built intentionally for its programming. 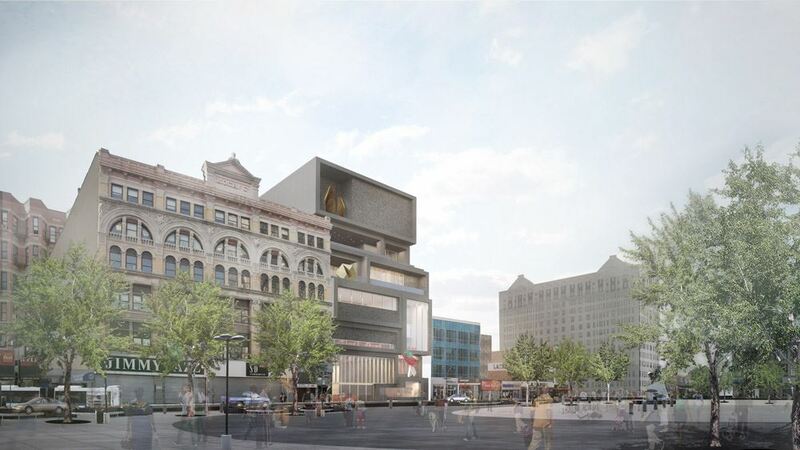 The Studio Museum’s new building, designed by Adjaye Associates in collaboration with Cooper Robertson, sought to create purpose-built spaces that celebrate the rich heritage of the institution, its relationship with artists and its role as a pillar of Harlem’s cultural life. Undertaken as a public-private initiative in partnership with the City of New York, the entirely new 82,000 square-foot building will be constructed on the site of our current facility, a century-old commercial building that was adapted for the Museum in the early 1980s by late African-American architect J. Max Bond Jr.
What’s going to be different about the new building? What new exhibitions/programs will be offered utilizing the new space? 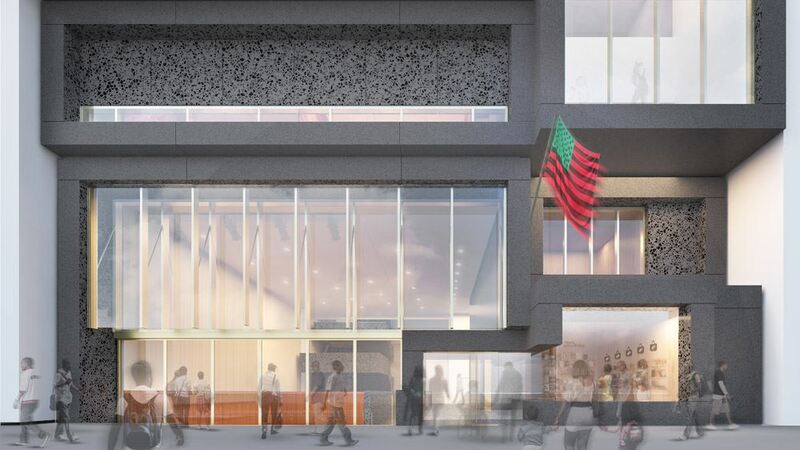 The new, 82,000 square-foot Studio Museum building is designed to express the Museum’s core values of openness and engagement, while also providing exceptional new spaces to elevate the Museum’s service to artists, audiences, the uniquely vibrant Harlem community, and the world of art. Space for exhibiting and creating artworks will more than double, allowing the Museum to share even more art from the permanent collection and temporary exhibitions year-round. Visitor, public, and educational spaces will increase by nearly 50%; and outdoor space will also double. Tell me more about the inHarlem program. In the summer of 2016, the Studio Museum launched inHarlem, a set of collaborative programs in our neighborhood. It has been an amazing way to deepen our roots in a community that we have been a part of for fifty years, and continue our groundbreaking exhibitions, public programming, and educational art-making workshops while the building is closed for construction. 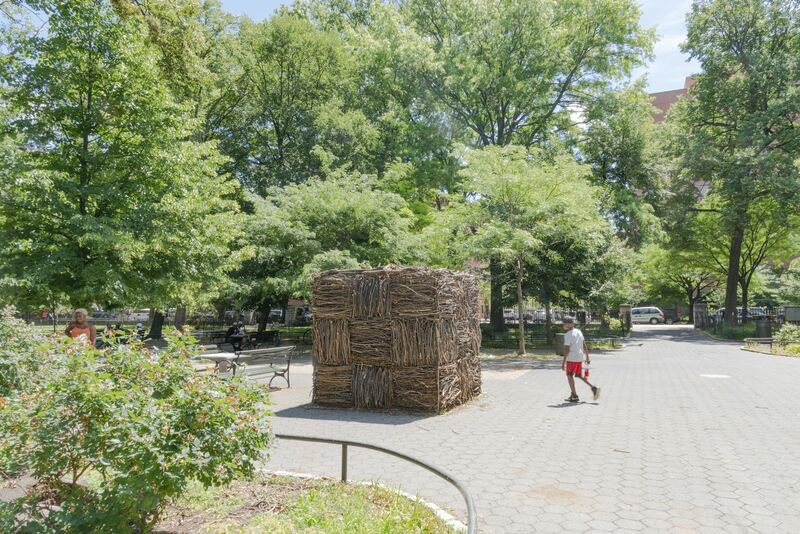 The first artists’ projects in 2016 were commissioned sculptural works by artists Kevin Beasley, Simone Leigh, Kori Newkirk and Rudy Shepherd, installed in Morningside Park, Marcus Garvey Park, St. Nicholas Park and Jackie Robinson Park. 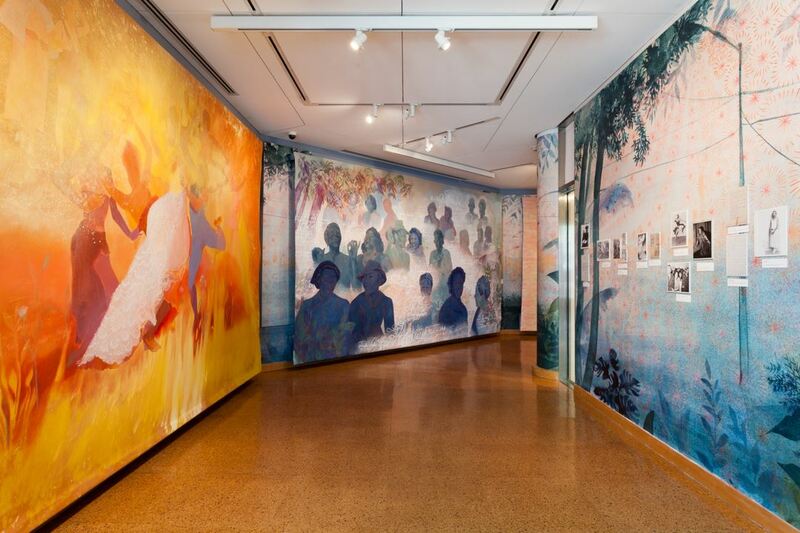 This marked the Museum’s first large-scale, public art initiative and was a partnership with New York City Parks and Historic Harlem Parks, along with the Marcus Garvey Park Alliance. Since this initial year-long project, we’ve increased programming to a variety of partner and satellite locations in Harlem, including New York Public Library branches, Maysles Documentary Center, the Schomburg Center for Research in Black Culture, and more. You can find our current inHarlem exhibitions, Firelei Báez: Joy Out of Fire and Maren Hassinger: Monuments, on view now at the Schomburg Center for Research in Black Culture and in Marcus Garvey Park, respectively. How has the community reacted to inHarlem? To the closure of the galleries? Our audiences have expressed great excitement for the future of the Museum. They’ve continued to support and engage with us at our various sites throughout Harlem and engagement online continues to grow! Our inHarlem programming lets our community and artists know that our work has, and always will be, for them. What are you most excited for with everything that’s changing? What do you hope your visitors will get out of this? I am most excited to experience the ways in which the Museum continues to grow and contribute to the rich cultural history of the community. I hope that our visitors are excited to join us on this journey of newness and change, and feel welcomed and empowered in our new home. Words by Sarah Heikkinen. Photos courtesy of The Studio Museum in Harlem. Engaging an entire community can seem like a daunting task for some small museums and historical societies – not everyone has a strong passion for the work museums do, or they aren’t interested in what’s presented to them at face value. Sometimes, community members may not even know that there even are any cultural institutions right down the road from where they live. At the Rensselaer County Historical Society (RCHS), located in downtown Troy, NY, the staff meets this challenge head-on. How do they do it? The answer is simple: they partner with their community to serve their community. On the last Friday of every month, the city of Troy’s Business Improvement District – Troy BID – hosts Troy Night Out, an “arts and cultural event that regularly draws thousands of people onto the streets of Downtown Troy.” Every month, the Troy BID works with local venues, boutiques, restaurants, venues, and cultural institutions (like the RCHS) to increase foot traffic in Downtown Troy and bolster the successes of small businesses in the city. 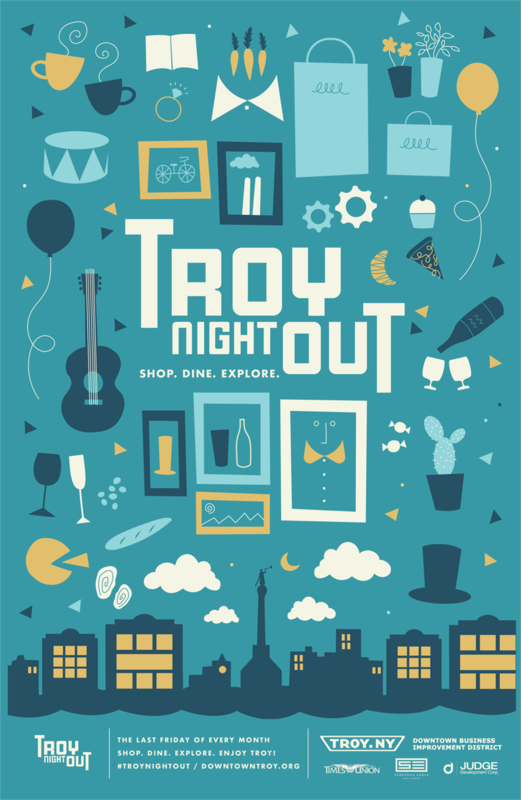 Businesses will often offer special deals or events on Troy Night Out, which has a different theme every month. In June, the theme was “Carnival!” Locally loved restaurants and bars added carnival- and summer-themed specials to their menus, boutiques and shops handed out free balloons and snacks, and the RCHS hosted author and baseball historian David Rapp for a special discussion of his new book, Tinker to Evers to Chance: The Chicago Cubs and the Dawn of Modern America. No matter the theme of the month (July’s theme is “Where in Troy is Uncle Sam?”), Krasevac-Lenz says the RCHS always has something going on when Troy Night Out rolls around. Whether that’s a special micro-exhibit that ties in with the Troy Night Out theme or with a relevant event in Rensselaer County history, visitors can be assured that the RCHS will be participating. When the RCHS hosted the Capital Region Underground Railroad Conference, they displayed an exhibit on art of the Underground Railroad at the following Troy Night Out. 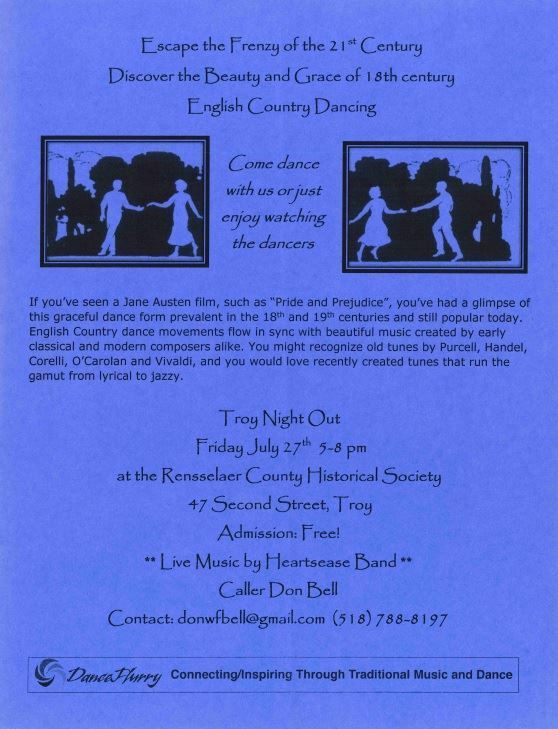 And this month, they’re hosting a historical English line dancing class with Don Bell and the Heartsease Band. “We try to have something special every time to draw people in,” Krasevac-Lenz says. By participating in Troy Night Out, the RCHS has opened their doors to members of the Troy community who may have otherwise never set foot in their local historical society. Krasevac-Lenz says that they’ve had visitors come in during Troy Night Out who have never been in a museum. “If they stay 15 minutes and they leave and say, ‘Eh…I don’t know,’ well, at least they’ve experienced a museum. We’ve gotten them in the door,” she says. So, why should smaller museums get as involved in their communities as they can? 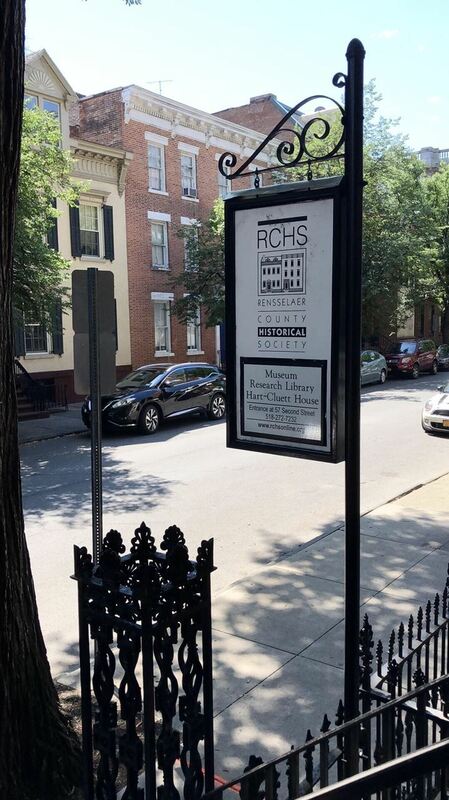 Krasevac-Lenz says the most important facet of the RCHS’ mission – and the mission of cultural institutions as a whole – is to serve their community, both members and otherwise. Words by Sarah Heikkinen. Photos by Sarah Heikkinen, RCHS, and Troy BID. How many famous artists can you name? Five? Ten? Maybe more? Now, how many of those artists were men? How many were women? Chances are, the first names that popped in your head were those of art history’s most recognizable male artists. If you thought of any women, ask yourself: were they among the most famous artists of all time – women like Frida Kahlo and Georgia O’Keeffe who have transcended the art world’s historic predication towards favoring men to become household names? With the country celebrating the centennial of the 19th Amendment until 2020, which granted women the right to vote, cultural institutions across New York – like the Hyde Collection in Glens Falls – are doing their part to honor women’s historical impact on art, culture, and history in New York State. The Hyde Collection was founded by Charlotte Pruyn Hyde in 1952, with a founding mission to “maintain a Museum for the exhibition of the permanent collection and to promote and cultivate the improvement of the fine arts, for the education and benefit of the residents of Glens Falls and vicinity and the general public.” Eleven years later, the Hyde opened as a museum, quickly establishing itself as “one of the Northeast’s exceptional small art museums,” with a permanent core collection acquired by Charlotte and her husband, Louis Hyde. Since its founding over 50 years ago, the Hyde has become known for its impressive exhibitions of classic American and European art, with work by world-renowned impressionists like Edgar Degas and Pierre-Auguste Renoir housed in their core collection. But in August, the forgotten women of the impressionist movement will finally get their due with the Hyde’s two upcoming exhibitions, Jane Peterson: At Home and Abroad, and Changing the Landscape: Women Impressionists from the Thomas Clark Collection. “Jane Peterson probably was the best known of women artists of her day,” says Canning, who has been working on the design of the At Home and Abroad exhibition in preparation for its opening on August 5. Born to a middle-class family in mid-19th century Illinois, Jane Peterson – whose given name was Jennie – quickly rose to prominence in the art world of the late 19th and early 20th centuries. She attended classes at the newly formed Pratt Institute in Brooklyn and the Art Students League in New York City. After completing her studies, Peterson, like most young artists of her time, traveled abroad to Europe to study under artists like Frank Brangwyn in Venice and London, Joaquín Sorolla y Bastida in Madrid, and Jacques Blanche and Andrew L’Hote in Paris. After finishing her European tour and a solo trip to Egypt, Peterson returned to the United States, where she became a pillar of the arts colonies on the East Coast. 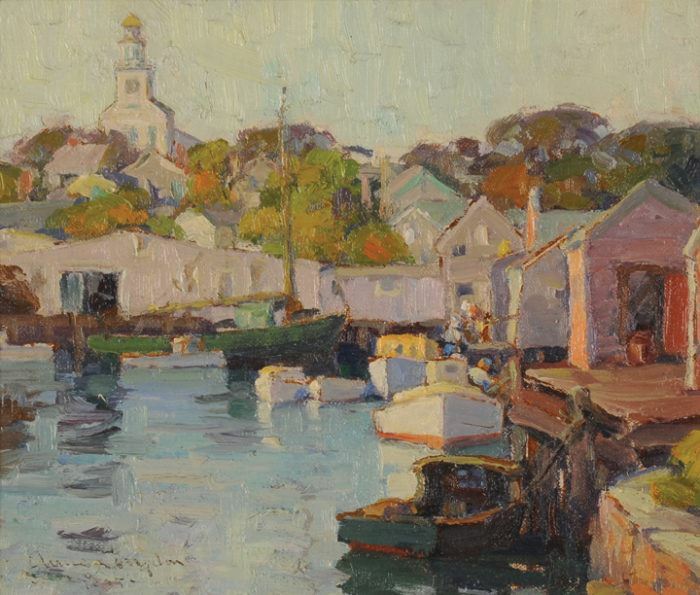 While her pieces from her travels across Europe throughout her life inform the “Abroad” section of the Hyde’s exhibition, her paintings of scenes around Gloucester, MA, are the core of the “At Home” side of the gallery, along with scenes from her transcontinental travels with her friend and patron, American designer Louis Comfort Tiffany. While Peterson has continued to be a well-known name amongst American art historians – Canning says most of his colleagues were familiar with her work when they began working on curating the exhibit – she is only one among many women impressionists of her time that is still remembered in modern times. With the influence of “les trois grandes dames” of impressionism (Mary Cassatt, Marie Bracquemond, and Berthe Morisot) – who were taken under the wings of Claude Monet, Edgar Degas, and Edouard Manet – women who aspired to be artists in a time when doing so would be considered improper and nothing more than a hobby were given a chance to show the world what they were capable of by joining the impressionist movement. 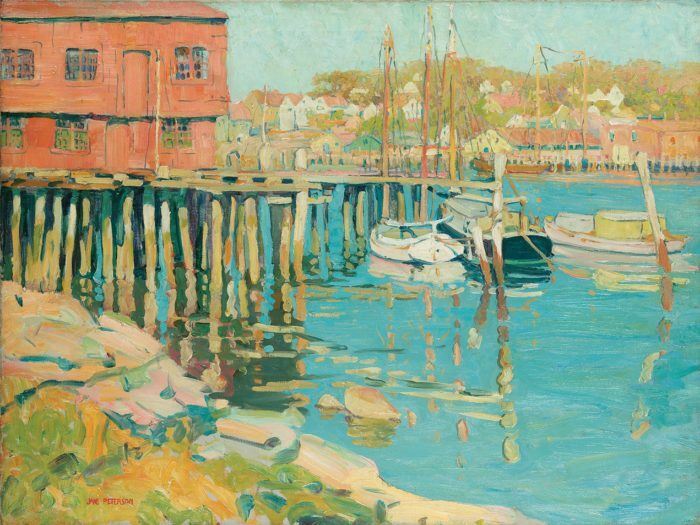 Anne Ramsdell Congdon (American, 1873-1958), Nantucket Harbor, 1935, oil on canvas board, 8 x 10 in., The Thomas Clark Collection of American Paintings. The main difference between Peterson and her contemporaries, like Mabel Woodward, Louise Upton Brumback, and Anne Ramsdell Congdon (all of whom will be exhibited in the Thomas Clark show), is that one of them managed to survive the test of time, and the others were forgotten. This was not for lack of talent, merit, or renown in their lifetimes, Canning says. Post-war styles of abstraction and pop art changed the tides of aesthetics in the art world, which led to the erasure of most of the women who had become significant members of the impressionist and expressionist movements. The Clark exhibition will feature 21 female contemporaries of Jane Peterson, fortuitously complementing the At Home and Abroad exhibition. Thomas Clark, a collector from the Capital Region, has been building his collection of impressionist work for several decades, with a special focus on landscapes. “He’s really got some depth within that,” Canning says. “He has gone for paintings that appeal to him, that show skill in use of color and composition and handling of paint, and isn’t worried so much about the name recognition of the artist.” This, Canning says, is how the Hyde has been able to draw the group of 21 women from Clark’s collection. Canning has tried to make sure that it will be clear that the art market of the time opened up to train and promote women impressionists. “It’s really our mistake to have forgotten them,” he says. While Canning says that the Hyde’s shows have been very 20th century-focused this year, with exhibitions of Alphonse Mucha and Rockwell Kent during the first half of the year, the Jane Peterson and Thomas Clark shows hold an important place in the museum’s plan for engaging their audience. “We’re at a moment where we are taking stock of women’s place in American society,” he says, especially at a moment in time when the erasure of women throughout history and art is more prevalent and political than ever. Both exhibitions allow for the rediscovery and reclamation of exceptional women artists, who through no fault of their own, were forgotten. Canning’s own goals as the curatorial director at the Hyde will be advanced by the Jane Peterson and Thomas Clark shows. “I’m constantly thinking about providing variety, always having a solid base in what I know our audience likes, but introducing something new,” he says. In the coming year, Canning will continue to expose the Hyde’s audiences to art and artists of whom they might not be aware, like the women in impressionism exhibitions. The Hyde will be finishing out 2018 with an impressive show of Japanese prints from the art galleries at Syracuse University. In 2019, visitors will be treated to exhibitions featuring photography, urban scene paintings from John Sloane, and prints by Pablo Picasso, Georges Braque, and Fernand Léger. The most important thing, he says, is that visitors leave the shows knowing that the Hyde will be completely different the next time they come. Jane Peterson: At Home and Abroad and Changing the Landscape: Women Impressionists from the Thomas Clark Collection open at the Hyde Collection August 5. Visit their website for more information and visitation hours. Words and photos by Sarah Heikkinen. Are you inland or coastal? Do you travel on, in, along, around, or over? What do you celebrate at the shoreline? I am very pleased to announce that the Museum Association of New York (MANY) will be the organizational partner for the state-wide tour of the Smithsonian Museum’s Museum on Main Street Water/Ways exhibition. Museum on Main Street (MoMS) exhibitions are designed to inspire dialogue, connect communities, and open doors to new programming through an expertly designed traveling exhibit. MANY is delighted to help build the capacity of our state’s museums and cultural heritage organizations by bringing this national program to our state as we celebrate the Erie Canal Bicentennial. The exhibition and programs produced across the state about our waters will tie stories about New York’s history, art, and culture to the story of our nation and our world. 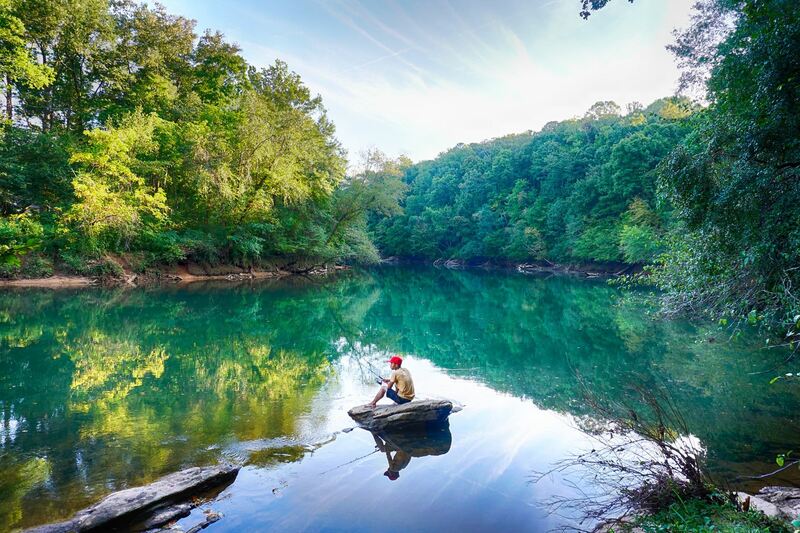 Fishing on the Chattahoochee River, Ga. Photo by Steve Harwood. Water/Ways will travel to six small- to mid-sized museums for six weeks each between June of 2019 and April of 2020. Three museums along the Erie Canalway National Heritage Corridor in the Western, Central, and Capital regions will be selected. The fourth site will be located in the Hudson River National Heritage Area, the fifth in Suffolk County, and the sixth location will be a museum in any part of the state that makes a strong case for the importance of water to its history and cultural heritage. The goal of the program is to bring the highest quality exhibition possible to museums that can leverage this resource to build long lasting relationships with their community, add local resources to a national program, improve organizational sustainability, and create a convening location for discussions where everyone’s water story can be heard. Sites will be selected through an application process. Each site will be judged on its own merits and its ability to muster the resources necessary to host the exhibition. Successful applicants will have a proven track record of community collaborations through exhibitions, school partnerships, and public programs. Additional decision-making factors will include the ability to care for the exhibition, commitment to plan and implement at least four public programs/events, and experience developing exhibitions that interpret the natural environment through the arts and humanities. The exhibition is comprised of five easy-to-assemble, free-standing sections and two interactive kiosk monitors. Museums will be required to contribute between $250 and $500 (on a sliding scale by budget size), cover the cost of shipping the exhibition to the next host site on the tour (estimates pending), meet exhibition space and security requirements outlined in the application form, and comply with the ADA. Water|Ways requires a minimum of 800 square feet with 8.5-foot ceiling and electricity. Museums will also be required send two staff members to attend training workshops in December 2018 and spring of 2019 (dates and locations pending). Additional information and a sneak-peak video about the exhibition can be found here. Hadley Exhibits, Inc. provided inaugural funding with partial project support that will allow MANY to cover exhibition rental costs, deliver training and capacity building workshops with MoMS staff, waive registration fees for most of our fall 2018 professional development programs for selected site museum staff, and provide promotional materials (banners, posters, postcards, docent handbooks, teacher resources, press kit, and social media templates). MANY staff will be available for ongoing consultation and support and will help connect sites to local art centers and regional cultural institutions. We are seeking additional sponsors and funding sources to help support programs and community-based exhibitions that share all of New York’s water stories. Interested museums should send an email to me: esanger@nysmuseums.org by 5 PM on July 13 with “Interested in Water/Ways” as the subject line. I will reply with the RFP and application attached. I will be happy to answer questions about the process and share ideas for the exciting ways this program can make a splash in your community once you have read the materials. Applications are due by 5 PM on August 10 and I will notify selected museums on August 24. MANY jumped into Water/Ways with both feet, but not much time to spare to bring this important program to New York State in time for the Erie Canalway Bicentennial. We are riding a fast tide to June 2019 and I look forward to seeing you on the water! Glass may be fragile, but the meaningful connections the Corning Museum of Glass’ GlassBarge forges in the communities it visits are anything but. On the longest day of the year, residents of the Capital Region gathered together on the Hudson in Troy, NY to learn how glassblowers at the Corning Museum of Glass (CMoG) in Corning, NY make the intricate pieces on display at CMog at a live demonstration on the GlassBarge. “We couldn’t have asked for a better day,” Steve Gibbs, Senior Manager of Hot Glass Business at CMoG, said to the 150 people in the sold-out bleacher seats on the Barge. The GlassBarge was launched this year to celebrate the 150th anniversary of Corning’s glass-making industry move from Brooklyn to Corning, NY. The celebration coincides with the 200th anniversary of the construction of the Erie Canal – for which the Barge is a signature event – and the 100th anniversary of the Barge Canal, the waterway’s third expansion. Over the course of four months, the Barge will be retracing its original journey before making its final stop in Corning on September 22. GlassBarge launches in Brooklyn. Photo courtesy of CMoG. The GlassBarge launched in Brooklyn Bridge Park in late May and traveled up the Hudson with stops in Kingston and Poughkeepsie before docking in Troy and Waterford for five days of demonstrations on the Hudson. Their next stops? Harbors along the Erie Canal. The original Barge’s journey to Corning started in 1868, when the Brooklyn Flint Glass Company chugged along New York’s waterways before landing in Corning. This led to the evolution of the company into Corning Incorporated, officially bringing the glass industry to the Southern Tier, and resulting in the founding of CMoG in 1951. 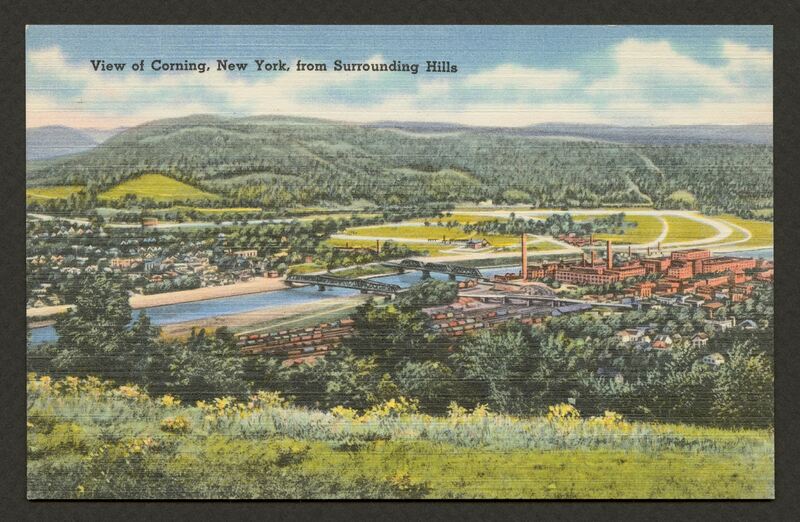 Postcard, View of Corning New York from Surrounding Hills, Boston: Tichnor Bros., Inc., about 1930-44. Brian Stratton, the former Mayor of Schenectady and current director of the New York State Canal Corporation, said that the GlassBarge journey was “magical,” continuing on to reflect that the Barge was celebrating an inherently New York story. Stratton compared the impact of the original Barge’s journey to the construction of the Erie and Barge Canals, which helped lead to the founding of the Rensselaer Polytechnic Institute (RPI) and the introduction of the engineering program at Union College. “We’re contributing to things that make our great state the Empire State,” he said. The local sponsors of the Barge were invited onstage to for a ceremonial hot glass ribbon cutting. A representative of Capital Bank, the Barge’s largest local sponsor, was given the opportunity to cut the ribbon, honoring the Barge’s commitment to engaging the communities it passes through. “I might make my shoes a victim of [the glassblower’s] talents,” he joked, brandishing a pair of large shears before (safely) cutting the hot glass ribbon. The hot glass ribbon cutting. Photo by Sarah Heikkinen. After the local supporters of the Barge left the stage, the audience was treated to a stunning demonstration by CMoG glassmaker G. Brian Juk, who has been blowing glass for 20 years, and his two assistant gaffers. Juk walked through the construction of an intricately designed bowl. At various points throughout the demonstration, the crowd was wowed by literal sparks flying off the glowing, malleable glass as Juk carefully crafted the bowl (which was too hot to touch – the molten glass in the GlassBarge’s furnace is kept at 2100°F). CMoG glassmaker G. Brian Juk shaping the bowl for the demonstration. Photo by Sarah Heikkinen. As everyone carefully made their way off the Barge after Juk and his gaffers stored their finished bowl in the 900°F cooling oven called an annealer, almost everyone stopped to ask Juk questions about his work. The GlassBarge will continue its journey westward on the Erie Canal, docking in Buffalo on August 3 before turning around for the final legs of its journey back to Corning. It will be accompanied by the Lois McClure, a replica of an 1862 canal barge, and the C.L. Churchill, a 1964 tugboat; both vessels are part of the permanent collection of the Lake Champlain Maritime Museum. Dates and locations can be found on the CMoG website. Whether we’re professional curators or not, we all do it. Some people collect art or stamps, and sometimes even more eclectic items, while other’s curatorial pursuits find them invested in America’s favorite pastime: baseball. 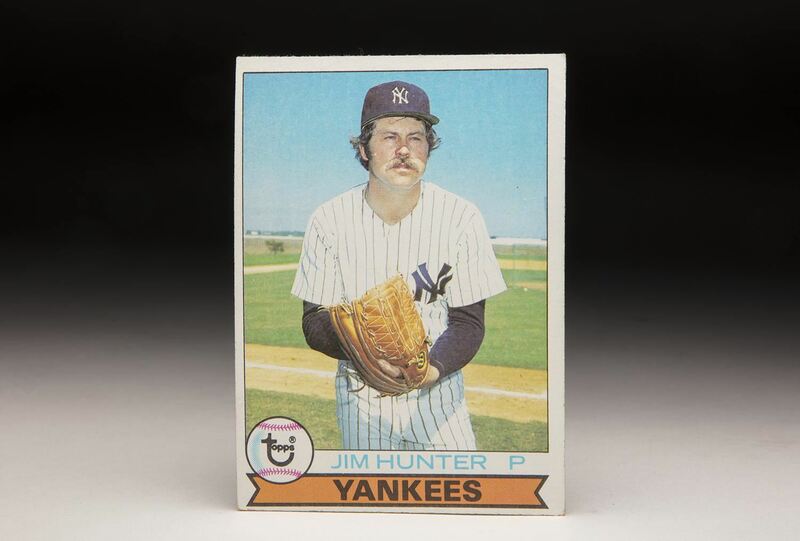 At the National Baseball Hall of Fame and Museum in Cooperstown, NY, the hobbyist will mesh with the curator in the Hall of Fame’s upcoming exhibition, Shoebox Treasures, opening next spring. Shoebox Treasures will take a deeper exploratory dive into the hobby of collecting baseball cards, examining the history, tradition, and design evolution of cards. 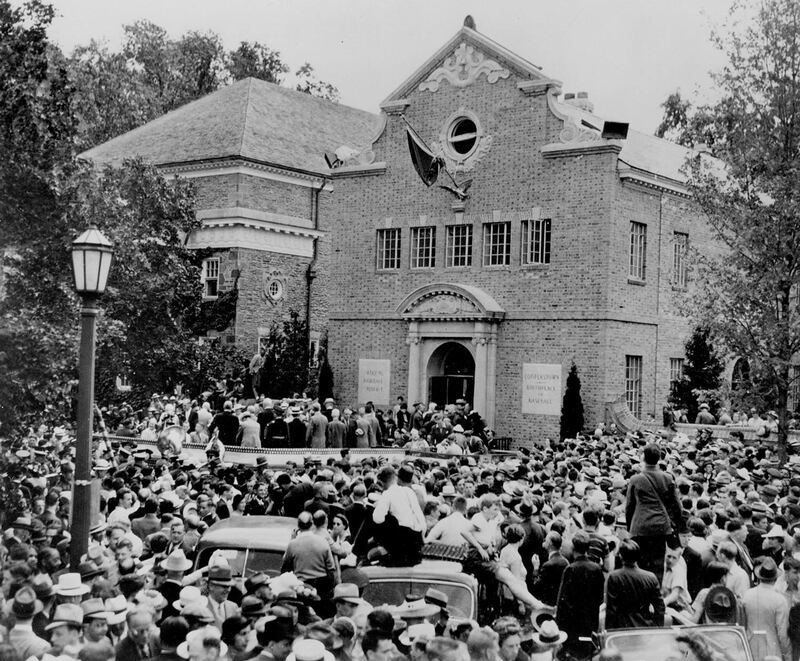 The National Baseball Hall of Fame on opening weekend, 1939. While the Hall of Fame has had exhibits devoted to baseball cards in the past, Strohl, who has been with the Hall of Fame for 20 years, says none of them offered an interpretation of the practice of card collecting like Shoebox Treasures will. Even after the public outcry that followed the closure of the previous baseball card exhibit, Strohl says the Hall of Fame was in no rush to put something back up on display. “We wanted to do it the right way,” he says. 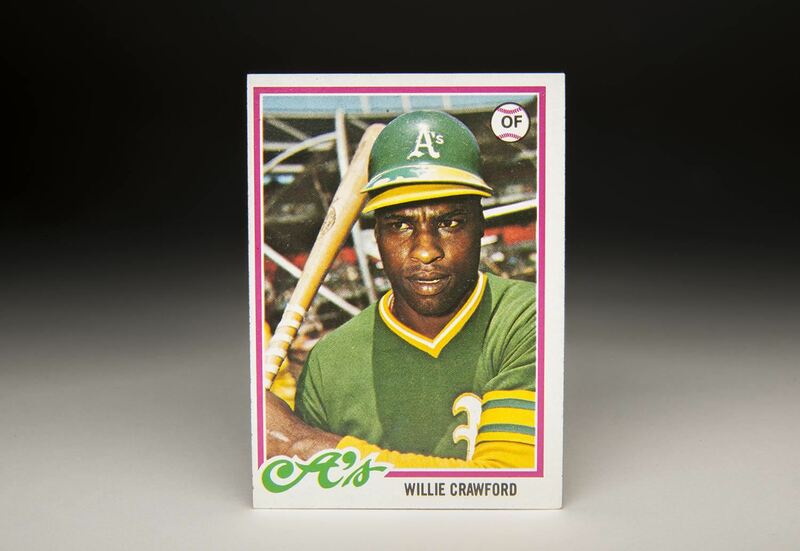 Shoebox Treasures will explore the history of baseball cards, but with a twist. They’ll be approaching their interpretation from a variety of standpoints – collectors, producers, and players – while also using innovative new technologies to showcase the Hall of Fame’s collection of 140,000 baseball cards. 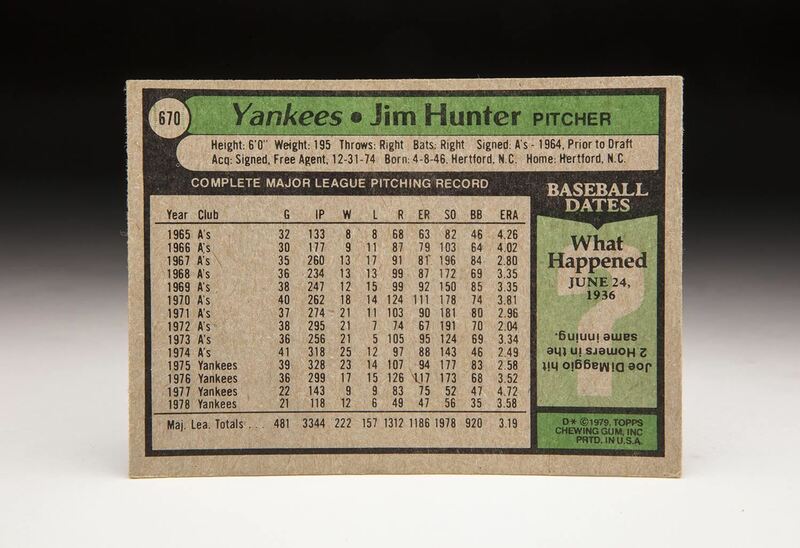 Jim "Catfish" Hunter's Topps card (Milo Stewart Jr./National Baseball Hall of Fame and Museum). Strohl says he and the rest of the Hall of Fame staff are excited to be incorporating displays and technology in Shoebox Treasures. The exhibit will be implementing new tools of conservation in their baseball card display. The cards will be kept in drawers that visitors will be able to pull out to view an entire panel of cards, which Strohl says will reduce the square footage of the exhibit while also allowing them to show more cards in less space. 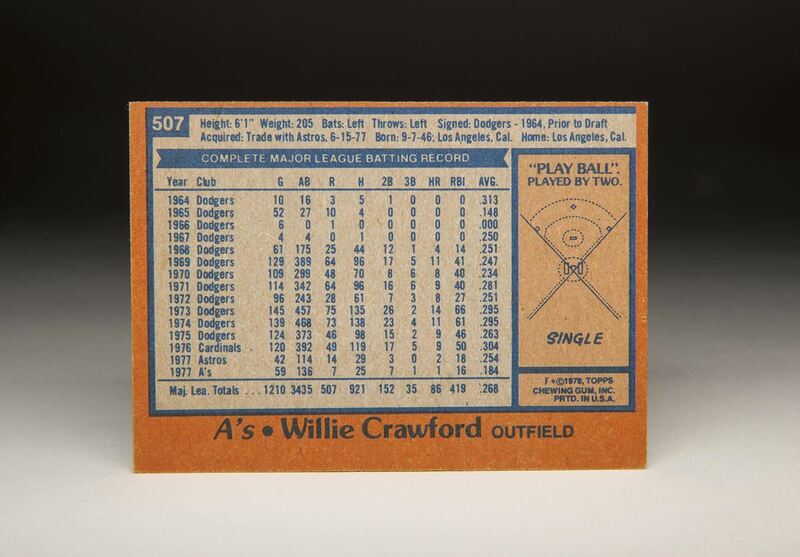 Willie Crawford's Topps card (Milo Stewart Jr./National Baseball Hall of Fame and Museum). The duality of collecting as being both hobby- and museum-based is one of the main themes of Shoebox Treasures. Initially, the Hall of Fame had planned to examine the relationship between hobbyists, investors, and collectors, but soon realized that there was less of a distinction than they had thought at first. While there are investors and collectors out there who are savvy when it comes to investing in the rarest and most expensive cards, both Meifert and Strohl say they’re all hobbyists at heart. Meifert has been handling the Hall of Fame’s fundraising efforts for Shoebox Treasures since the exhibit’s proposal was accepted in January. The proposal estimated that the total budget for the exhibit would be $800,000; in the five months since the Hall of Fame started fundraising, that goal has been surpassed by 10 percent. Learn more about Shoebox Treasures here. Words by Sarah Heikkinen. Photos courtesy of the National Baseball Hall of Fame and Museum. Over the past decade, virtual and augmented reality tools have become increasingly popular interpretive resources for museums. Now, visitors are exposed to new, innovative experiences at their favorite cultural institutions, sometimes without even needing to leave the comfort of their homes. From 360 videos on Facebook and YouTube, to mind-bending apps to use on site, museums are experimenting with exciting ways to engage their audiences. In 2017, the Smithsonian American Art Museum teamed up with Intel to “develop an experience that takes advantage of room-scale VR’s immersiveness.” The Smithsonian and Intel worked with VR studios like V.A.L.I.S. and Framestore to make a virtual recreation of one wing of the art museum. Devindra Hardawar, a writer for Engadget, said his experience with the virtual tour wasn’t “photorealistic,” but was still fairly convincing. “It felt like I was standing in a museum, which is the ultimately the most pressing goal,” he wrote. During a recent exhibition of Parisian artist Modigliani, the Tate Modern in London conceptualized a virtual reimagination of his final studio in Paris, where the artist lived and worked between 1919 and 1920. The Tate, in partnership with VR company Preloaded, reconstructed the studio using the actual physical space as a template, then referenced “first-hand accounts and historical and technical research” to create the VR experience. The museum also digitally recreated Modigliani’s artwork, collaborating with the Museu de Arte Contemporanea de Universidade de São Paulo, Brazil and The Metropolitan Museum of Art. “This research allowed us to portray these artworks with painstaking accuracy, from the surface texture of the canvas, to the types of paint and brushes the artist may have used, to the type of stretcher the self-portrait may have originally been painted on,” the Tate wrote on their website. And now, this groundbreaking technology has made its way up to the Adirondacks at The Wild Center in Tupper Lake. The Wild Center officially opened its doors on July 4, 2006, beginning over a decade of celebrating the Adirondacks as “a great American success story.” Since then, The Wild Center has expanded its range with interactive exhibits and programs like Planet Adirondack, Wild Walk, and the Youth Climate Program. Now, with the help of Patrick Murphy, the Center’s Community Engagement Coordinator and recipient of MANY’s 2018 Rising Star Award of Merit, the Wild Center is heralding in a new era of immersive museum experiences with their recent collaboration with the virtual and augmented reality company, Frameless Technologies. 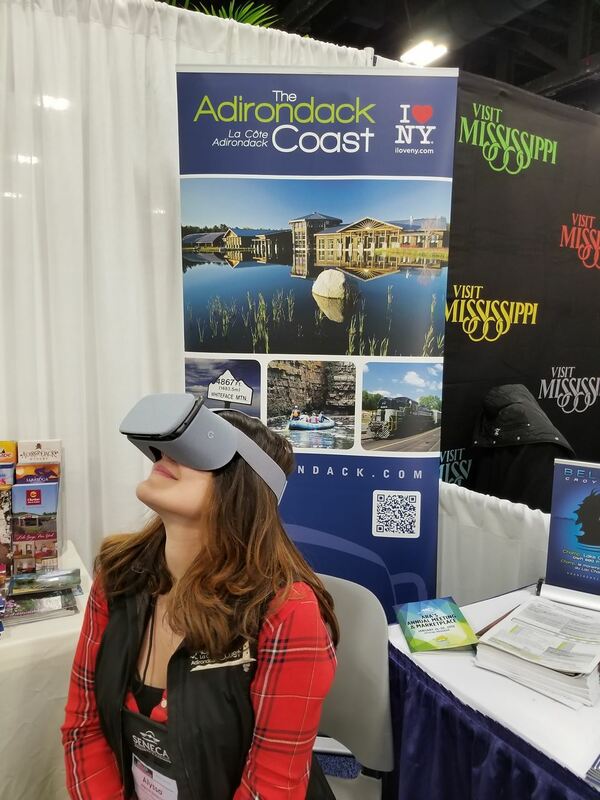 When Murphy attended last year’s New York State Tourism Industry Association annual conference in Lake Placid, he was struck by the conference’s emphasis on the benefits of virtual reality on the tourism industry. He had previously been made aware of Frameless Technologies through the Center’s Executive Director, Stephanie Ratcliffe. Murphy worked with Frameless Technologies to shoot a sample of what they could do for the Center – a 360 video tour of the site. Like the VR experiences at museums like the Smithsonian or the MOCA in Los Angeles, the Center’s 360 video creates a new opportunity for off-site visitors to immerse themselves in a space to which they may not readily have access. The Wild Center is also home to two other immersive virtual reality experiences: Science on a Sphere (SOS) and an augmented sand table. 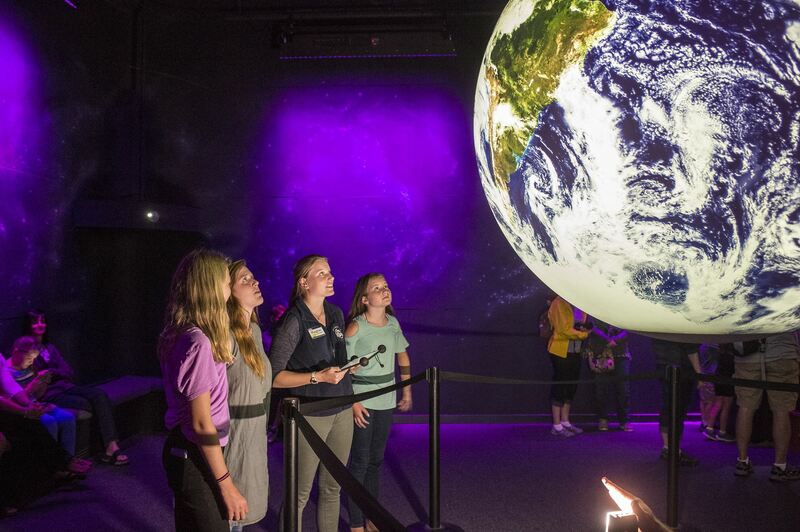 Developed by the National Oceanic and Atmospheric Administration, Science on a Sphere is a “room sized, global display system that uses computers and video projectors to display planetary data onto a six-foot diameter sphere, analogous to a giant animated globe,” according to NOAA. Science on a Sphere at The Wild Center. Photo courtesy of The Wild Center. 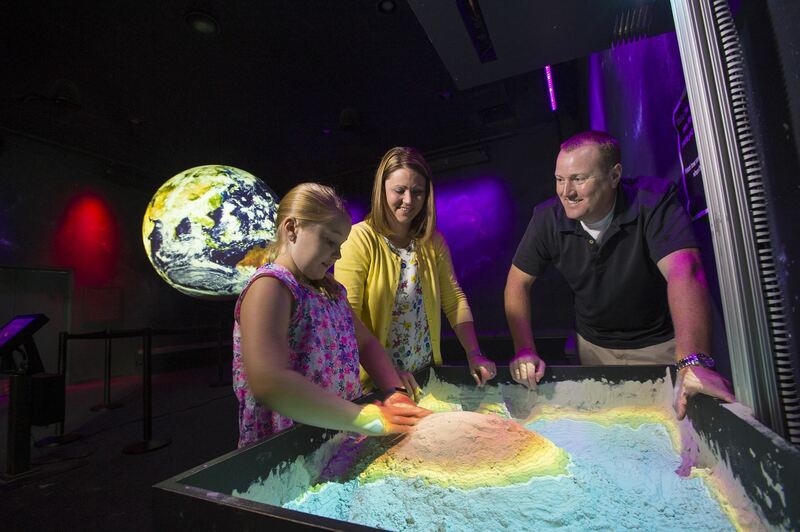 The SOS system gives museums and science centers like The Wild Center the opportunity to enhance their educational programs by directly putting their visitors into the learning experience. So, what does this all mean for other museums and cultural institutions like The Wild Center? Traditionalists may say that adding technology like virtual reality and augmented reality defeats the purpose of the tried-and-true museum experience, when in actuality, these resources may serve to enhance that experience. “Virtual reality is the only type of media that elicits both a mental and physical response,” says Gaaserud. The augmented sand table at The Wild Center. Photo courtesy of The Wild Center. Bringing new technology into museums broadens the scope of people that can be reached, especially if it’s technology that can help transport someone on Long Island to the Adirondacks with just a click of a button. From the Smithsonian to The Wild Center, the possibilities are endless. Words by Sarah Heikkinen. Photos and video courtesy of The Wild Center. Over the next three years, the Mid-Hudson Children’s Museum (MHCM) in Poughkeepsie, NY will be developing and building an exciting and bold new museum campus along the city’s waterfront. “It feels like the stars are aligning,” says Lara Litchfield-Kimber, Executive Director of the MHCM. The expanded campus, “The Museums at Upper Landing,” will be built on the Upper Landing Property, which currently includes a pocket park along Poughkeepsie’s northern waterfront and will eventually be home to four museums, including the Children’s Museum, which borders the property. The park and surrounding properties were previously owned by The Dyson Foundation, who, in late 2017, sent out a call for development proposals from nonprofits in the Hudson Valley to take stewardship of the property. The MHCM had already been weighing their options for the museum itself after realizing that their current space was nearly at capacity. Litchfield-Kimber says they were considering more expansions to the museum and had even thrown the idea of relocating the museum on the table when they were invited by the Foundation to submit a proposal on what they would do should they take ownership of the land. “The timing of everything was really exciting,” Litchfield-Kimber says. Dyson Foundation President Andrea Reynolds said in a press release that the Foundation chose the MHCM because their proposal offered a more compelling plan for the restoration of the property, adding that their goal had always been to transfer stewardship of the land to a responsible nonprofit who would keep the public’s interest in mind during development. “We think the Children’s Museum offers a plan that fulfills that goal,” she said. While actual construction on the site won’t start for three years, work for Litchfield-Kimber and her planning team has already begun. For the next year, the MHCM will be studying the property, which includes determining the feasibility of transforming the two vacant, yet historic buildings on the Upper Landing Property – the Reynolds and Hoffman houses – into a new science center. In June of next year, the ownership of the property will officially transfer to the MHCM. This not only includes the vacant lots, but the Upper Landing Park itself, which Litchfield-Kimber says the MHCM will maintain. So, what exactly is the MHCM’s goal in transforming this property into a museum campus? Litchfield-Kimber, who comes from a science museum background, says she’s particularly excited to introduce more science and math-driven educational content to the Poughkeepsie community. “We do get a lot to get families comfortable and ready for a lifelong museum habit,” she says, “but I would love to be able to offer more for older kids.” The Museums at Upper Landing will transform the two historic buildings on the property into science centers targeted at older children and teenagers, something Litchfield-Kimber is very passionate about. “We realized that each of these buildings could be built out into their own spaces so we could take a scaffolding type of approach to engaging families as their kids grow,” she says. As the home of IBM, the Hudson Valley as a whole has the potential to become a hub for science-loving students – particularly those interested in STEM – to further their education. Litchfield-Kimber says that technology companies, schools, and colleges in the Hudson Valley had begun to express concern that they didn’t have a natural space for students to grow, or the resources to attract and encourage students in STEM to stay local, which is where the MHCM’s new campus comes in. “We see a way to contribute to our community in a real regional way that will allow students who are coming up through our pipeline to not feel that to get ahead, they have to leave [the Hudson Valley],” she says. Initial concepts for the campus include the transformation of the Hoffman House into a science center for younger children; the Reynolds Building becoming science center for teens and adults that would explore issues at the cross-section of science and society; and the renovation of the MHCM’s Pavilion into a food hub that would also serve as a museum, event space, and culinary center for families. “It is not often that a new science center or museum opens its doors, making this potential project a special prospect for the Hudson Valley Region,” said Cristin Dorgelo, President and CEO of the Association of Science-Technology Centers, in a press release distributed by the MHCM. “We’re really excited to see how we can create a canvas that can change up pretty regularly, and also be a hub for really important community conversations,” Litchfield-Kimber says. 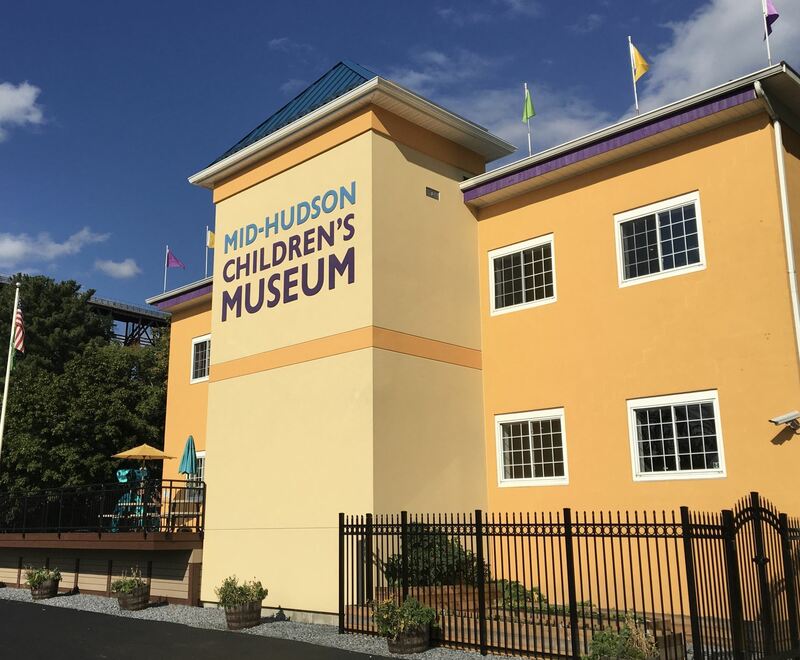 More information on the Mid-Hudson Children’s Museum can be found here. Photos courtesy of the Mid-Hudson Children's Museum. Words by Sarah Heikkinen.